Have you ever wondered why so many superheroes wear their underpants outside of their tights? Is that the real source of their power do you think? 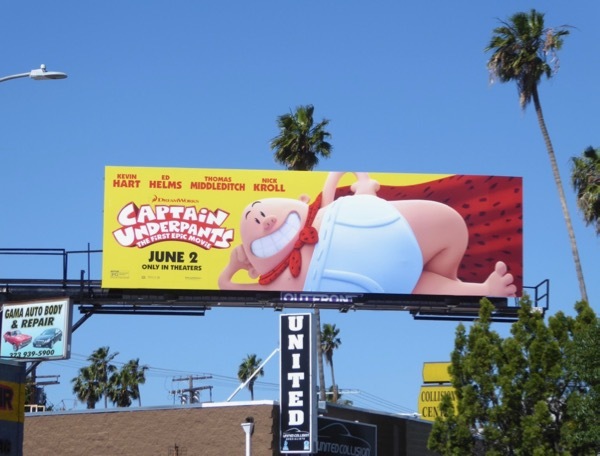 Maybe we'll find out in the new computer-animated comedy Captain Underpants: The First Epic Movie. Based on the popular children's novels written and illustrated by Dav Pilkey, the movie sees two elementary school pranksters (voiced by Kevin Hart and Thomas Middleditch) hypnotize their mean-spirited principal 'Mr. 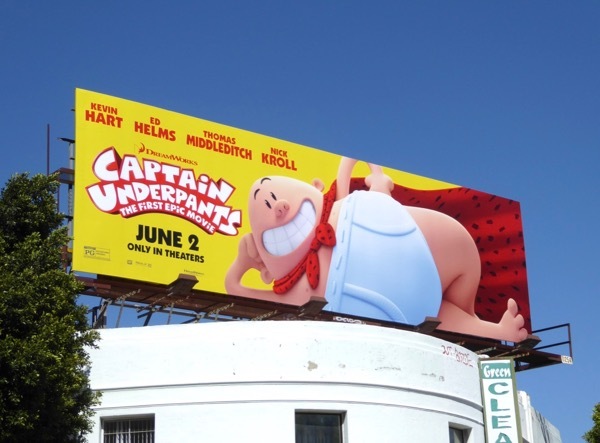 Krupp' (Ed Helms), making him believe he's the overly enthusiastic, yet dim-witted caped hero 'Capain Underpants'. These yellow and red ads certainly stand out and help brighten L.A.'s 'May Grey' and 'June Gloom' skies and the standard landscape movie billboards were photographed along Pico Boulevard on May 13, 2017. Meanwhile the special extension cut-outs were first spotted along La Brea Avenue on May 13, then snapped later along the busy Overland Avenue at National Boulevard on May 28, 2017. 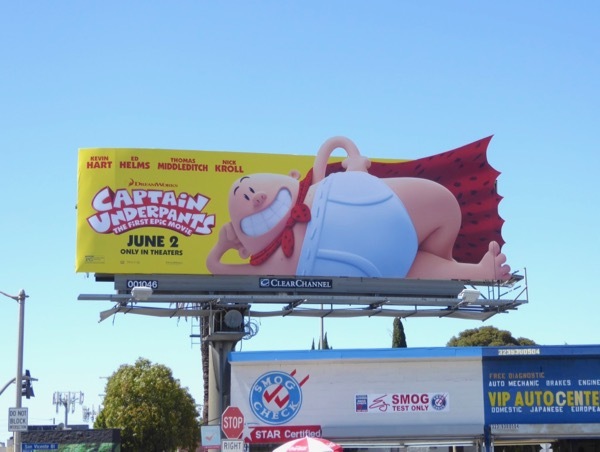 Let's see if Captain Underpants will join the crime-fighting pantheon of superheroes by saving the summer box office, or whether he'll be tied-up as Wonder Woman storms into solo action at cinemas on the same day.